Visit www.pbs.org/teachers and http://www.pbslearningmedia.org/ for many more on-air and online resources. More than 85 activities that support and extend children’s learning in the four STEM disciplines Stimulate and engage children’s thinking as you integrate STEM experiences throughout your classroom. These engaging, developmentally appropriate activities maximize children’s learning in science, technology, engineering, and mathematics. Each experience combines at least two STEM disciplines and incorporates materials and situations that are interesting and meaningful to children. 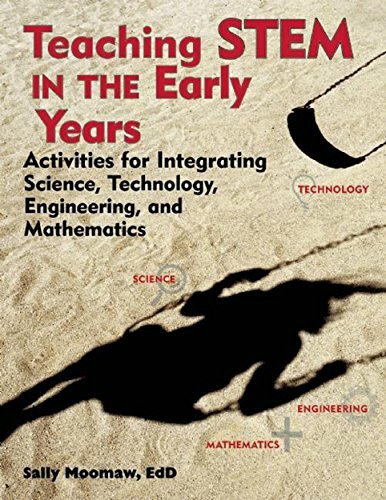 Use this book to discover the many possibilities for teaching STEM to young children, including ideas for Learning centers Cooking, art, music, block play, and sensory table activities Outdoor time Project-centered curriculum Quick activities that require minimal preparation on your part Field trips With the growing focus on early childhood mathematics and science, this book is a much-needed resource for every early childhood classroom. It will encourage you to think differently about STEM education, and you will see how easy it is to accommodate curriculum goals and learning standards in math and science activities. Sally Moomaw, EdD, is an assistant professor of early childhood education at the University of Cincinnati. She is the author of eight other Redleaf Press books and a frequent presenter at workshops and conferences across the country. Much of Dr. Moomaw’s research and teaching is in the area of STEM education. This Web site for the Curious George PBS television series offers early childhood educators the opportunity to extend the learning of the on-air episodes. Online video, educational games, a teacher's guide and activities reinforce early learning concepts in math, science and engineering. This award-winning series features exciting adventures that teach core math and science concepts. The Super Cyberchase Science theme page highlights resources that promote math and science connections, and The Inventor’s Workshop game introduces students to basic principles of physics and engineering. Dinosaur Train embraces and celebrates the fascination that preschoolers have with both dinosaurs and trains, while encouraging basic scientific thinking skill as the audience learns about life science, natural history and paleontology. This program provides children with opportunities to explore science and engineering to share the excitement of scientific discovery. The Web site includes a wealth of science related games, activities, and streaming video. This site teaches children about environmental science and includes two immeresive interactive games as well as lesson plans for grades K-4. This reality series for kids presents a variety of challenges that participants must solve collaboratively using their science know how. The site offers fun games and activities that test and expand users’ science knowledge. SciGirls is out to change how tweens think about science, technology, engineering and math, or STEM! In each episode, join bright, curious real girls in putting STEM to work. Then check out the website to play games, watch episodes, share projects, and connect with other SciGirls in a totally safe social networking environment. Sid the Science Kid is designed to further develop children's natural wonder and build a strong foundation for early science exploration through engaging episodes and online resources that explore topics such as tools & measurement, transformation & change, the senses, simple machines, and backyard science. Discover the joy and wonder of science with Cat and his friends as he takes preschoolers on a wild learning adventure! Dr. Seuss's The Cat in the Hat guides friends Sally and Nick - with a little help from the Fish, Thing 1 and Thing 2 - on fun-filled adventures where they make natural science discoveries, from how bees make honey to why owls sleep during the day. This program and site promote activity-based learning about science and engineering and include fun math-related exercises like detecting patterns, taking measurements, and using spatial logic. Search the complete catalog on http://www.pbs.org/teachers/math Mathline provides over one hundred free standards-based lesson plans and video lessons. Teachers can search this comprehensive catalog by keyword, topic, or grade range. This bilingual Web site features math teaching tips, fun learning activities, recommended books, and a child development trackers with early math milestones. This site offers various lesson plans and math activities that relate to the American democratic process, including exercises about the electoral process, national economy, and mapping.